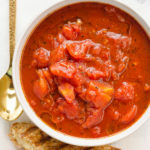 This is EASY and BEST homemade tomato soup from tomato sauce with grilled cheese for a 10 minute healthy dinner. Preheat medium pot on low-medium heat and swirl olive oil to coat. Add garlic, oregano and basil. Saute for 30 seconds, stirring constantly. Add canned diced tomatoes, balsamic vinegar, salt and pepper and let simmer for 3 minutes or until warmed through. In the meanwhile, make grilled cheese. Serve with hot soup. So easy, tasty and healthy! Low sodium tomato sauce works great in place of diced tomatoes. You can also use half and half. Any dried Italian herbs or seasoning is great! Add more garlic and fresh basil at the end if you wish. This soup is super easy and forgiving!